SlideFest Philippines:Gliding Your Way through 1,000ft of Fun! Slidefest Philippines is a family-friendly, adrenalin pumping slip and slide water event. It is more than just a slide. It’s a festival, an experience that brings our memories of our childhood to the next level. It is 1,000 feet of pure happiness. There will be music, food, drinks, water balloons, water guns, and of course the biggest slip and slide ever to hit the streets of the Philippines. And have we mentioned that our slide is 1000 feet long? Yeah, that’s the length of over 3 football fields, or 3000 doughnuts. This will be a festival you will never forget. Single sliders will get unlimited access to the slide... Or so they would wish. Single sliders will (obviously) get only ONE slide within their selected time session. We're gonna go out on a limb and say it straight up that we do not recommend this option unless you are the type of person who can resist eating just one piece of M&M or pringles, stop at just one slice of bacon or stand up after a 2 minute swedish massage. Yes, the slide is 1,000 feet but trust us, with the amount of fun you'll have, it will go by really fast and you'll be left craving for more. Wave Sliders get to enjoy the slide again and again, get some rest, talk to your friends, take some selifes and then go again within their selected 2 hour time slot. All day sliders are like wave sliders but on steriods. VIP's can enjoy unlimited slides for the entire 12 hours of the day and will be entitled to an express lane similar to priority boarding in an airport. You also get cool Slidefest T-shirts and 20% off the other merchandise. And to make sure that you get top priority, we are setting a limit to the amount of VIPs we will accommodate. - Slidefest Subic will be on April 18, 2015. - Early Bird Registration for the event will start on February 15, 2015. - Regular Registration will start on March 1 and will be until April 17, or until all slots are filled up--whichever goes first! 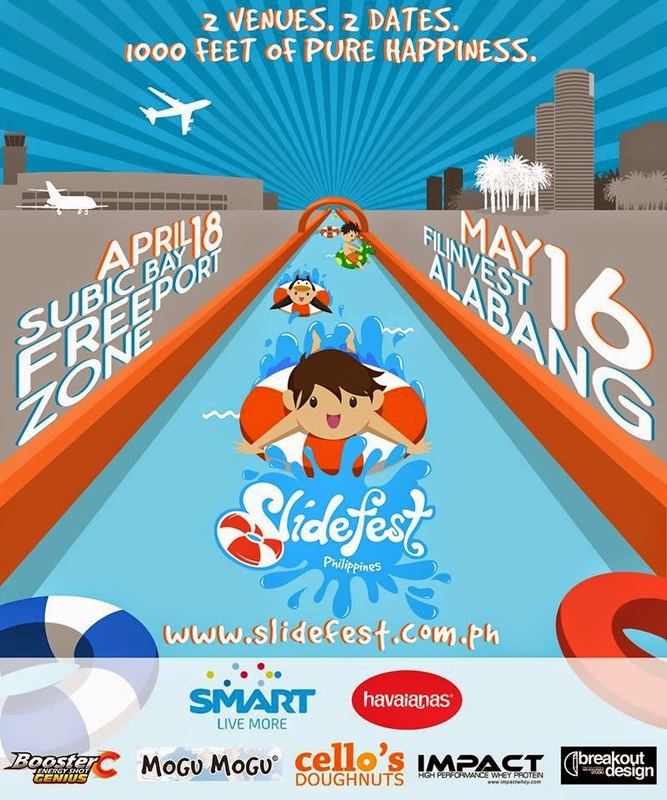 - Slidefest Subic will be in the Subic International Airport. - Stay tuned for a link to the map. - Slidefest Filinvest will be on May 16, 2015. - Early Bird Registration for the event will start on February 15, 2015. - Regular Registration will start on March 1 and will be until May 15, or until all slots are filled up--whichever goes first! - Slidefest Filinvest will be in Pacific Rim Street in Filinvest City, Alabang.